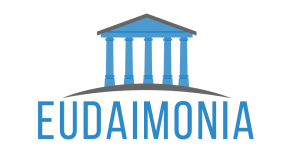 Your reviews are food for thought for us, also great help for future clients of Eudaimonia, an excellent promotion and of course the best reward for our efforts. We have invested a lot of our resources into creating our tours and making them different, authentic, real experiences of Greece. 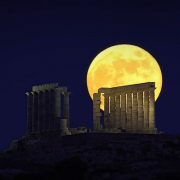 We would like to thank everyone who has chosen to travel with Eudaimonia Private Tours of Greece. Please read below some reviews and get a feeling of what to expect! Having discovered Eudaimonia on Trip Advisor, reading a review of someone else’s experience, and how the services provided under the attention and care of their driver, had such a positive impact, I decided to investigate. Immediately as soon as I established email communication, I felt reassured that my needs would be understood and our particular interests would be prioritized. This could not have been more true. As our trip and experience in Greece evolved over time, so enamored we became, by the safety, convenience and efficiency of our newly discovered traveling means and the wonderfully pleasant, amiable and most accommodating nature of our driver, Nikos, soon to become friend, that we extended our plans under his guidance making for the most memorable and intimate experience of Grecian culture, food, the land and it’s people. The options all along the way, to personalize our trip, to alter our plans, and/or to temporarily detour into an impromptu inclination, allowed our trip to enfold more effortlessly and efficiently; spending much more time taking it all in, rather than feeling expended. As anyone with traveling teenagers knows, it can be difficult sometimes, accommodating their often precarious temperaments, especially while vacationing: it could be a challenging undertaking to be in the car with a teenager for long road trips. Not only did our son feel at home, but we found him often more readily inclined to do more and venture further than we would typically expect: testimony to the effort our driver made to have him feel comfortable and a part of the journey. First class tour, fantastic guide! We had an amazing guide during the two days we spent with him in Athens. We saw the popular sites but he also gave us a taste of ‘the real Greece’ and gave us an experience that we will never forget. He talked to us and found out what we were interested in and then took us to places that suited us perfectly. For example I like ‘old style’ Greek cuisine so he took us to a brilliant place off the beaten track which you’d never find by yourself. 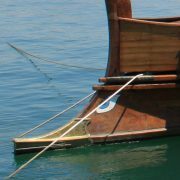 We like boats so he took us to see a range of vessels from an Ancient Greek boat to a modern warship and other craft of historical interest. These are not in guide books or easy to get to so it was a unique trip. His English is perfect – he speaks it like a native and he has a great sense of humour so he was fun to be with too! He is very knowledgable on a wide variety of subjects, we had some very interesting conversations with him and learned a lot about the places we saw and about Greek culture. He gave us a unique experience and we are planning to book with him again when we make our next trip to Athens. Thank you! Great country, great day, great trip! 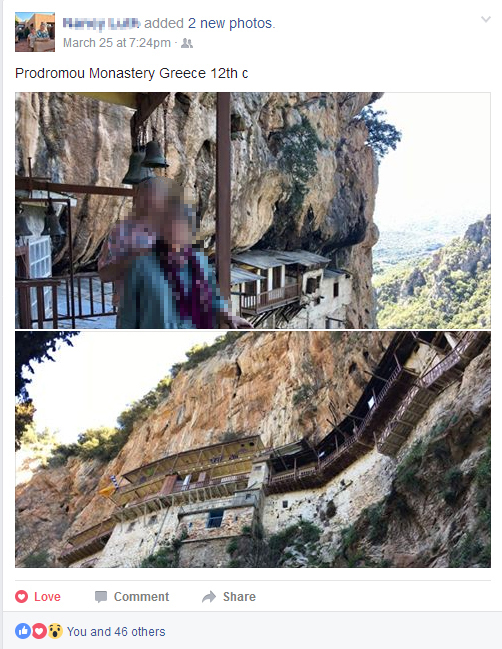 It was a great experience, and our family – me, my husband and our teenager son- were really happy that we made a choice with Hosios Loukas monastery. 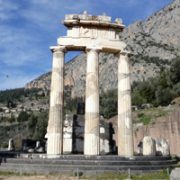 Delphi was a fascinating place, and we were glad to come there early in the morning and enjoy the charm of the place without crowds of tourists running around. We made a slow walk up enjoying the countryside with blossoming trees and majestic ruins around us. The museum on site is very informative! 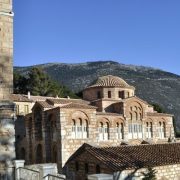 The monastery of St. Loukas was a place where you can realy experience a feeling of being here and now: calm, spiritual, yet friendly atmosphere. And few words about our guide. It looked like he really enjoyed our excitement and really minded what we liked – architecture, landscape or food. He shared a lot of knowledge during the trip, and it made it a very special one. We enjoyed our maiden Greek trip with help of Eudaimonia’s great lady guide. The driver for this self-guided tour was extraordinarily helpful and friendly. He was informative and answered our questions . 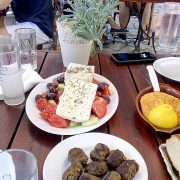 The lunch was delightful and in a small town on the plaza at a town near Hosios Loukas. He was careful to drop us off and pick us up and convenient locations which enhanced our tour. His driving was safe and beyond reproach. I would highly recommend this tour. Our trip with Eudaimonia tours was exactly what my friend and I hoped for with our trip to Greece. Was the best paid by our terms and would highly recommend it. Nikos, our guide, was friendly, full of information, and put us at ease the first day. It was great traveling in a car instead of a bus, and have a guide all to ourselves. 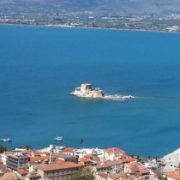 Nikos told us basic history of each site as we were heading there, Mycenae, Nafplio fort, and Epidaurus theatre the first day, and gave us tips on where to go and what to see while there. To our joy we found out that all archeological sites are FREE to EU students!! Everything was on our own time, we never felt rushed, and could fully enjoy the beauty of Greece and it’s history. We had the best lunch in a small village Nikos and his wife had discovered. The food was amazing and truly authentic, no tourist faire. We even got serenaded by the locals, not an everyday occurrence I am sure! The apartment you stay in is large and can easily fit 4 people comfortably. Yota is the hostess and she makes you feel right at home. Nikos recommended restaurants for us to try and the food did not disappoint. The next day we went to Hydra, which was picturesque. Spetses island was the next day, although bigger, most places were getting ready for the tourist season, and not all of the shops were open. But the lack of people made it ideal to explore. 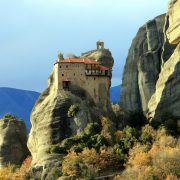 These tours are definitely the best way to see authentic Greece, away from the tourist route. I would definitely use this company again! 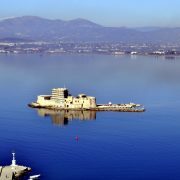 Zackary: I stumbled upon this trip when looking for things to do in Athens and the surrounding area. 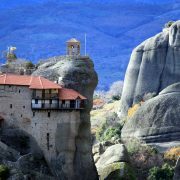 The experience was great as you are able to travel away from Athens and see a bit of the Greek countryside and more local areas. 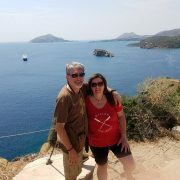 Nikos and Yota are wonderful hosts and will work to accommodate you in any way so you can get the most out of your trip. We opted for a home cook meal the first night we were there which cost extra but is well worth the money. Yota is an amazing cook and baker and we didn’t find anywhere else that had baklava as good as hers. If you opt for the meal you will not go hungry we had leftovers for the next day. The islands are both beautiful. My personal favorite was Hydra. The apartment tree house has one bath and two bedrooms, one with a full bed and one with bunk beds. There is a full kitchen so you can cook if you want and the balcony view shows one side of Ermioni peninsula and the main port. 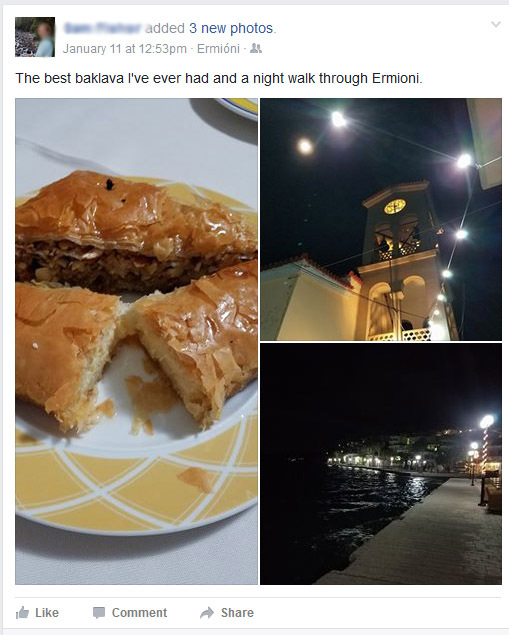 Samantha: “The best baklava I’ve ever had”. 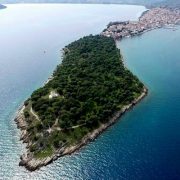 My personal favorite island was Hydra. Thank you both for your hospitality. The trip was amazing and gave a view of Greece I think many people miss out on. This tour was wonderful! Both Delphi and Hosios Loukas Monastery were fascinating UNESCO sites. Our guide Nikos from Eudaimonia Private Tours was great! Very thoughtful and informative. 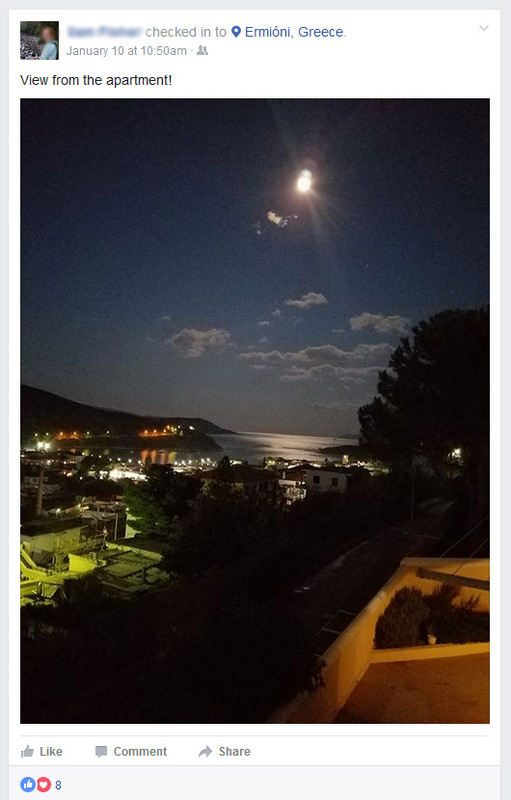 We enjoyed him so much, we booked a private tour with him for a second day of touring Lousios river & gorge, villages & monasteries οf central Peloponnese. We had an amazing day with memorable experiences on this excursion. Our guide, Nikos, was friendly and knowledgeable and truly delivered on showing us this amazing area of Greece. We stopped at the Corinth Canal and several monasteries, where monks gave us individual tours, complete with coffee and “tsipouro”. We also stopped in several mountain villages where we were able to hike around old alleyways and had an authentic Greek lunch at a local coffee shop. We traveled a different path than we did on the way in and were able to see a gorgeous forest and river. The best day trip of our vacation by far! Highly recommend to anyone looking to do something outside the beaches and islands! I had a great time with Nikos visiting Corinth canal, Mycenae, Nafplio, and Epidaurus. We had a great lunch in a town near Epidaurus very local place with no other tourists. In addition to the locations, there were stops for photos with impressive views. There is enough time to see all items in each location. 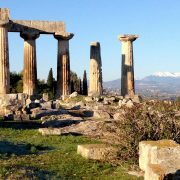 We included a visit to Corinth ruins with additional cost and time but it’s worth it!. Nikos will contact you promptly after reserving so that you can plan and arrange the tour. I enjoyed everything about the tour and really recommend it. Our hosts were very gracious and we had a wonderful time with them. Thank you so much for all of the great sights we saw. The home that we stayed in was very comfortable. We had a great selection of breakfast items in the refrigerator to choose from. We would definitely recommend this trip for other travelers. 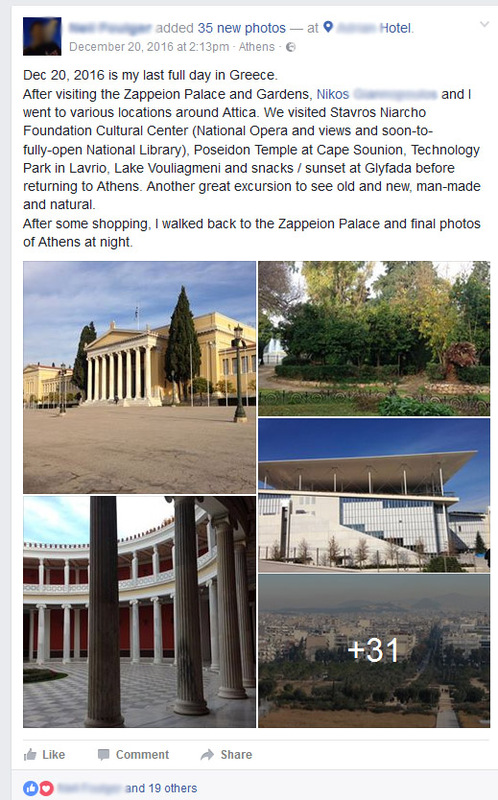 After visiting the Zappeion Palace and Gardens, Nikos and I went to various locations around Attica. 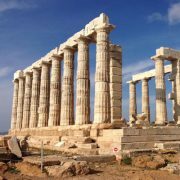 We visited Stavros Niarchos Foundation Cultural Center (National Opera and views and soon-to-fully-open National Library), Poseidon Temple at Cape Sounion, Technology Park in Lavrio, Lake Vouliagmeni and snacks / sunset at Glyfada before returning to Athens. Another great excursion to see old and new, man-made and natural. 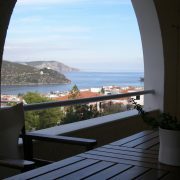 The highlight of our holiday was our stay in Ermioni with Yota and Nikos. Their Greek hospitality was outstanding. We were given the opportunity to visit ancient ruins that the average tourist misses. 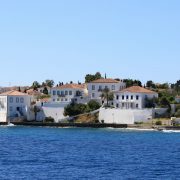 The trips to Hydra and Spetses were magic. The swimming at the islands was beautiful in warm pristine waters and both islands had their own charm. 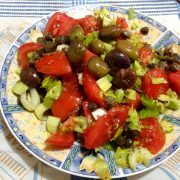 The home cooking was delicious and Yota really went out of her way to ensure that we received the full Greek experience. I cannot recommend this trip highly enough for anyone that wants to experience the real Greece. Booked the tour a couple of days before arriving in Athens. The drive to Delphi is about 2 hours. We stopped at a small town on the way up I think that the tour busses stop there on the way down. Nikos dropped us off at one end of the main street so we could do some shopping and get some coffee and walk through the town. He met us on the other side of the street to continue the trip. The scenery was great since he took the back roads to avoid the traffic on the highways. Once we got to Delphi, we agreed on a time and place to meet after we completed our tour. The Delphi site is amazing, as are the views. I would suggest going all the way to the top to see the Stadium first as it is a bit of an uphill climb. And if it’s hot and you have already been steadily climbing up hill, it can be a trek. Once you see the Stadium head down to view the rest of the site–and the views on your way down are made for photos and selfies. Once we finished, we met Nikos and then went down the road to the other part of the site–where the temples to Athena are located. 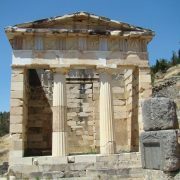 This is the site of the temple usually used on all of the advertisements I saw for Delphi. There were only about 5 people there touring including us. Nikos dropped us off and we arranged a signal for him to come get us when we were through. I don’t think the busses go there since there is hardly any parking on the side of the road. Once we left there we headed toward the Hosios Lukas Monastery (Holy Luke). On the way we stopped at a cafe/bar in another small town that had an outside area for drinks and snacks. Both were excellent. The owner kept bringing out various dishes for us. There were other locals at the bar and the weather was nice, so it was a great place to stop. 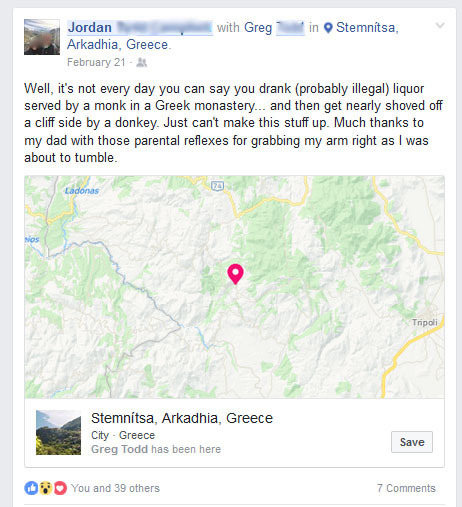 The Monastery is definitely recommended. It is still an active monastery the sanctuary is amazing and has been untouched since built in 953. The views are also great. We sat and had cappuccinos and pastry before leaving. Nikos’ son drove back and we got to the hotel in time to relax and head out for dinner. We mentioned to Nikos that we were planning to go to the market the next day in Athens to get some fresh figs while they were still in season. Unfortunately we never made it. However, when we got back to the hotel, Nikos had dropped off a Thank You note and package. Inside were fresh figs! This tour with Nikos was great! Aside from the trip to Delphi, we stopped for lunch in a small village that doesn’t see many tourists and visited the Monastery of Saint Luke — another off the beaten path gem. Nikos is full of insider knowledge and will go above and beyond to make your trip a success. What a wonderful experience! Nikos maintained excellent communication with us before the tour and was extremely prompt and generous with his time, insight, and resources throughout. 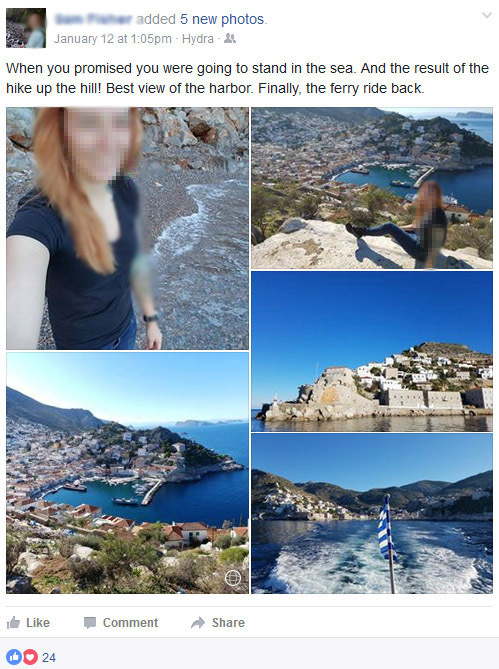 We were able to see and experience lots more than just the ruins of Delphi due to Nikos being accommodating, open, and willing to show us areas and facets of local Greek culture, food, and drink we never would have experienced in the same way otherwise. If you want to see Delphi and don’t want to get herded around on a bus with the masses, this is definitely the way to go! Thank you so much, Nikos! 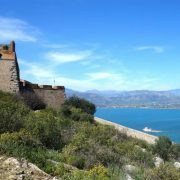 Dec. 19, 2016 was a spectacular private drive with Nikos into the northeast Peloponnese. We visited Corinth (canal, old city), Mycenae (3000 year old ruins), Nafplio (amazing scenery and buildings), Ligourio (lunch and ouzos), and Epidaurus (theater and ruins). Lots of olive trees and citrus groves here. I was looking forward to this excursion the most and I was proven right. Evening was souvenir shopping and dinner. 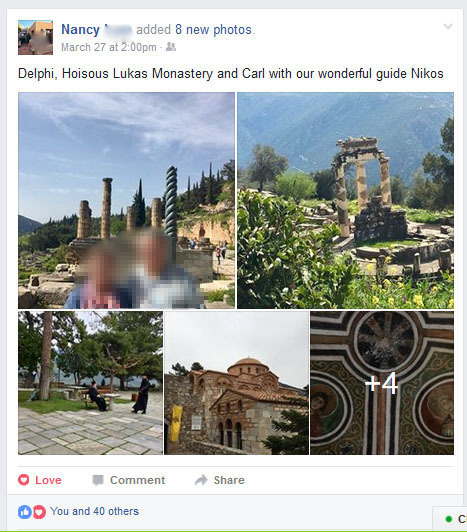 Nikos gave myself and two friends a wonderful private tour from Athens up to Delphi and, our favorite, the Osios Loukas monastery. He picked us up and dropped us off where we were staying. We arrived at Delphi well before the tourist buses got there, which made it feel like we had the place to ourselves. A nice change of pace from Athens! After spending a couple hours there he drove us to small village where we had several plates of delicious mezzes. Then we continued onto the monastery, which was absolutely stunning. 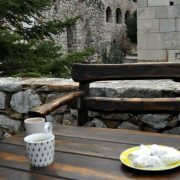 The setting was very serene and was the perfect place to enjoy a cup of Greek coffee and some home made desserts. We couldn’t have asked for a better day! Thank you so much Nikos! Our guide treated us to a top notch day trip to Delphi, Hosios Loukas (monastery), and an authentic Greek lunch. He also added in a quick side trip to a great little Greek town for some coffee. The guide was professional, knowledgeable and friendly, and transportation was clean and roomy. Our guide, picked us up a the cruise port terminal and our adventure started, He got to know us and made some excellent suggestions based on the conversation. 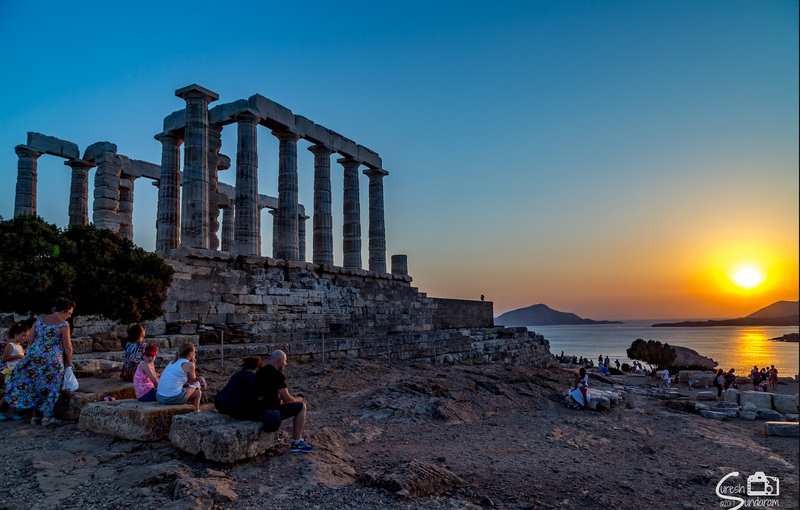 We have a nice swim in a private spa lake, a good cup of Greek coffee on top of the new Library complex, We have a great trip to the Cape Sounion and traveled back for and end of the day sampling of Greek foods in Athens. He dropped us off at the ship with plenty of time to spare. We highly recommend using EUDAIMONIA Private Tours, why travel with big crowds. Our guide personalized service was excellent and we will use him again to travel in Greece. We had a wonderful trip with with Eudaimonia and thought Nikos was a wonderful guide. We went for a wine tasting, visited the Planitero village, the cave of lakes, had a local Greek lunch, went on the Odontotos train (which had amazing views), and saw the Corinth canal. Nikos kept us fully entertained and told us a lot of interesting information throughout the day. 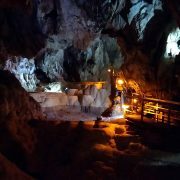 I would highly recommend this tour for anyone who is interested in doing something off the beaten track and far less touristy than the typical tours you might sign up for. Best two days of our trip! We loved our trip with Eudaimonia so much that we actually booked a second day with them (last minute). We had an outstanding tour guide and great conversationalist. The sights were amazing and, after a month of traveling, we can say with confidence that the two days with Nikos were the highlight of our trip. We would recommend Eudaimonia to anyone going to Greece! Perfect day; Mystras, Sparta, lunch at the top of the mountain and beyond! Nikos picked us up from the hotel in Athens and we stopped at the Corinth canal for a look, then on to the fabulous ruins at Mystras. I hadn’t heard of them but definitely worth seeing. Part of the ruins were closed (a church still in use) but a lovely lady opened them for us. 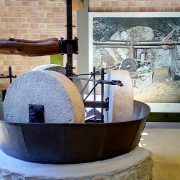 On to Sparta for the Olive Oil museum and then a very special side trip to an olive oil press where we met with the lovely people running it and tasted some different oils. The village at the mountains for a fantastic lunch–Nikos chose for us–and then across to the coast for the scenic trip back. Nikos is an interesting guide who personalizes the trip based on the participants. His English is perfect and he is great company. I can’t think of any detail that could have been improved upon. Thanks Nikos! WOW what can one say about this tour. It was excellent ! Our guide, Nikos, seemed more like a long lost friend than a tour guide. He tailored the tour to suit us, our fitness levels, food options and interests. We motored through the extremely winding roads of the Peloponnese mountains, stopping to explore and enjoy the mountain villages. We journeyed through the stunning forests of pine and autumn trees which were changing to brilliant colour. We visited two very stunning villages with narrow streets lined with tavernas and interesting shops selling local goods and souvenirs. We dined on local cuisine – sampling various Greek dishes. We explored the Museum of Water Power, which appeared to have had a recent upgrade using beautiful local timbers and beautiful stone work. We learned about the tanning process for animal hides, and sighted old machinery & stills. 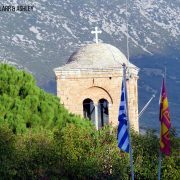 We stopped at the small church of St Ioannis, above the gorge, after visiting Monastery Emialon where we were shown the museum of icons and monastery artifacts. 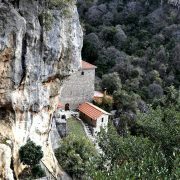 We later enjoyed Turkish delight and tasted a Greek coffee at the amazing Prodromou Monastery, which was part cave and hidden by the trees, becoming visible as it clung to the cliff face, only after a 15 minute walk through lovely rambling countryside. I highly recommend this tour. Thank you Nikos for such a wonderful day, your knowledge and your friendliness. We will definitely use your tour company again when/if we are ever back in Athens. Me and my girlfriend went on the tour to the temple of Poseidon, and we had a great time! Nikos was well spoken and super friendly, I can’t recommend this enough. Nikos was excellent and was unbelievably knowledgeable about the area and gave us great tips for our entire trip to Greece! After picking us up at our hotel, we chatted about preferences and interests and he shaped the day entirely around our wishes! It was nice to have a self-guided pace to explore the sights rather than be shuttled around in a tightly-planned tour bus like we saw. The entire drive we were peppered with interesting facts, which made the time pass quickly. He would even roll down the windows so we could take in the amazing scents of native wildflowers. We went completely off the grid for lunch in the tiniest of villages, sitting with the locals and enjoying an experience most tourists will never had. Nikos gave us some time to amble through the village of Arachova as well as pointers of what to see while in Delphi. We even stumbled upon marathon racers that morning and spent some time cheering them on! I cannot imagine them running those massive hills! They were crazy!! The highlight had to be our stop at Hosios Loukas Monestery. We were the only visitors that afternoon – what a wonderful and peaceful way to explore. You could tell Nikos had a great relationship with the staff there and it was wonderful to be able to engage in small talk with our guide throughout the day. We were in Greece on our honeymoon and the church we were married in was named St. Luke’s. We didn’t make the connection until we were there – what a way to have goosebumps! 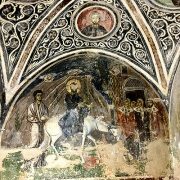 To get married in St. Luke’s, then end up paying homage to the crypt of St. Luke and his home monastery – you couldn’t write this! And thanks to Nikos we learned that they normally celebrate the arrival of Saint Luke’s remains back to Greece on December 11, but as fate would have it, celebrated last year on December 10, the same day as our wedding!! And we definitely purchased an icon of St. Luke while there to keep in our new home for good luck! He was able to work with the staff to get us some great artwork at a discount. 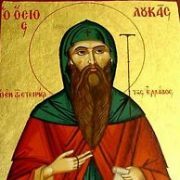 Don’t skip Hosios Loukas! It’s well worth the detour and extra cost! Run, don’t walk, when it comes to booking this tour! Nikos didn’t feel like a guide, but rather family by the end of the day. My wife and I used Eudaimonia for a pick up from Nafplio to visit Epidaurus, Mycenae. and the Palamidi fortress. It was a great choice. Our guide spoke excellent English (having studied in the UK) and was very thorough and professional in his communication. He met us at the cruise terminal and drove us to the sites, filling us in on a wealth of information on the way. 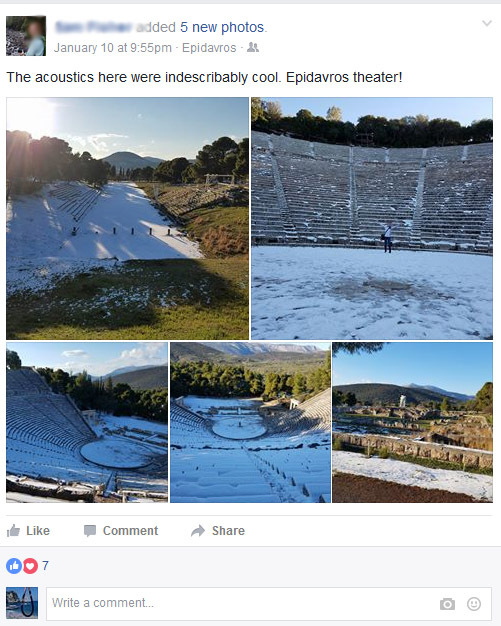 Epidaurus and Mycenae are both wonderful and we were free to tour there on our own (he did provide a guided tour of the sites). Nikos was patient, giving us plenty of time and each site, and took us for a really good and authentic Greek lunch off the beaten track that was really delicious. Our guide was good company and fun to be with. We would have no hesitation in recommending him. My wife, daughter, and I visited Greece for the first time this past summer. We spent three days in Athens to experience the rich Greek history that we had only encountered in history books. Since we had very little time and we wanted to have a very flexible schedule, we booked a private tour with Eudaimonia Private Tours. Even before we left, Nikos reached out to us via email and text to not only confirm the tours but discuss what we were interested in, whether we had any dietary restrictions (we are vegetarian), etc. He was very meticulous in his planning and communicated with us at all times and provided us with suggestions for additional activities. 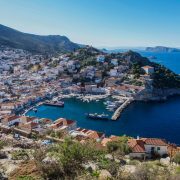 While talking to him prior to our arrival, we mentioned to him that we wanted to visit Lake Vouliagmeni and Cape Sounion on the day we arrived. He immediately cleared his schedule and arrived promptly at 4 p.m. to pick us up from the hotel. I am glad that we took the tour to Lake Vouliagmeni and Cape Sounion with him. During the drive, he provided us with a lot of information about the history of both locations that we definitely wouldn’t have gotten from reading a book. 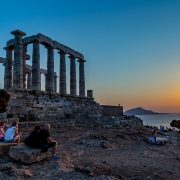 I am avid photographer and when he got to know that he stopped at multiple places on the way that had amazing views and I managed to get some great pictures of the sunset at Cape Sounion. Go there, if you haven’t already!!! The next morning, Nikos picked us up at 8 a.m. for a day trip to Delphi and Hosios Loukas monastery. Our first stop was at Delphi (a UNESCO World Heritage site) about 2.5 hours away and during the drive, Nikos used the time to discuss the history of Delphi and it’s role in Greek history. The entire drive went by fairly quickly as Nikos was a great conversationalist. 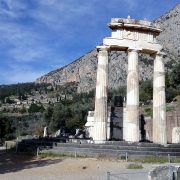 After we had finished the tour of the main site and the museum, he was waiting for us in the car but suggested that we visit the The Tholos at the sanctuary of Athena Pronoia is located about half a mile away from the main Delphi site and we are glad that we went there. 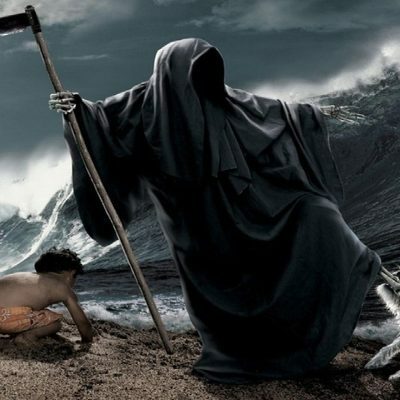 If not for Nikos, we would have never known about it. After we finished at Delphi, we had lunch in a small, quaint, but completely non-touristy town for lunch. Nikos ordered for us and ensured that all the food was vegetarian. I also learnt from him how to drink Ouzo the Greek way. After lunch, we went to Hosios Loukas Monastery. We didn’t even know about this till we booked the private and we are glad we did! The monastery is a also a UNESCO World Heritage Site. The monastery and its environs were beautiful and serene. It is located a little bit out of the way and overlooks a valley that is full of Olive trees. The weather at the monastery was very different from what we experienced in Athens and Delphi (which are hot in August, to say the least). While it was a warm day, the monastery was breezy and actually cool at what would be the hottest part of the day. Nikos brought some of awesome desserts (including Baklava, which a personal favorite of mine) and we even took some of it back for my wife who was unable to join us on the trip as she was unwell. Nikos also provided us with tips for the next day when we planned to visit the historical sites in Athens. He even offered to pick us up the next evening to take us to a really good local restaurant that served authentic, vegetarian cuisine. Unfortunately, we were tired the next evening and could not take him up on his offer. Thanks to an off-the-beaten path tour with Eudaimonia Private Tours, we have made a new friend in Nikos that we hope to stay in touch for a long time! Thank you, Nikos and Eudaimonia!!! 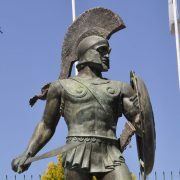 If you are planning a trip to Athens, I would strongly recommend Eudaimonia for a completely personalized experience!!! 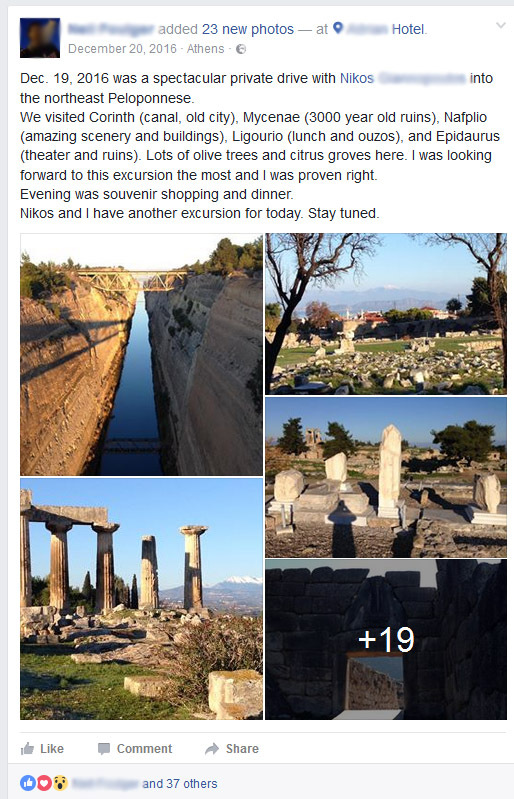 Awesome, professional, and exiting tours with Nikos. We were lucky enough to find this tour company and can only say wow. From the moment we were picked up to the moment we were dropped back at our hotel we had amazing and exiting tours. I personally have traveled the world and done private tours but never as impressive as these days we had with Nikos. Nikos also took us to authentic local and very impressive restaurants in varied areas of the country and his wealth of knowledge was complimentary to his excellent service provided to us. We would come back to Athens just to have more experiences with Nikos. 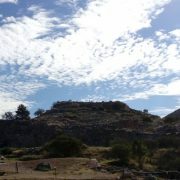 My family had a great time with Nikos on the Mycenae, Palamidi Castle and Epidaurus tour. These sites were so incredibly amazing – It felt like taking a walk through human history!! Nikos provided us with information about the history of each place we were going to and was able to take us directly to each place, meaning we weren’t hot, sweaty and too exhausted to enjoy the sights by the time we got there. 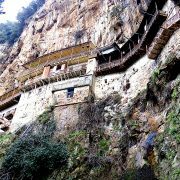 (For example, Palamidi castle is 999 steps up and down… Nikos drove us to the top and met us at the bottom! If you couldn’t do the steps he would meet you at the top.). 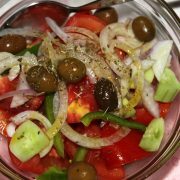 We stopped for breakfast snacks and a quick lunch in two gorgeous little villages on the way and got to taste some authentic Greek food which was delicious. When my teenage brother got sick halfway through the trip, Nikos watched over him and took him to the beach while we explored the castle. If we were on our own, it would have been game over by then, and everyone was kept happy and stress-free. It was an incredibly fun day made even better by such a lovely host. Make sure you bring sunscreen and good walking shoes! Wonderful Day Trip with Nikos! 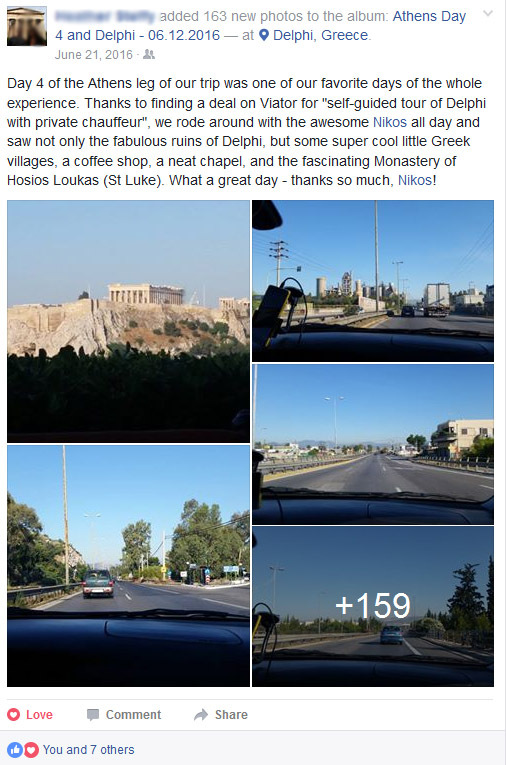 We had a wonderful day trip to Delphi with Nikos this past week – he was a wonderful host! We were picked up close to our lodging in Athens at 8 am, and headed to the beautiful site of Delphi. On the way, Nikos provided us with information about the site, along with pleasant conversation. After we finished at Delphi, we had lunch in a small town – this was one of my favorite parts of the day. Nikos ordered for us (after asking if that was okay), and we were treated to some authentic Greek culinary delights. We had Kolokitho Keftedes (zucchini meatballs), Vlita (greens that were exquisite), Salata Hoiratiki (greek salad), among other things, and also had some delicious desserts, to include Ekmec ( custard type dessert) and Kormos (an orange flavored cake). The entire meal was absolutely delicious. We were also taught how to appropriate drink Ouzo 🙂 After lunch, we went to the Monastery of Hosios Loukas – it was beautiful and free of tourists, as most do not even know or think to go there. That was the beauty of this tour – we were off the “beaten path”, so to speak, for most of the day. In addition, Nikos provided us with a box of fresh baked Greek desserts to take back to our apartment to enjoy that evening. They were wonderful! We really enjoyed this trip, I highly recommend it! Thank you Nikos! Please check our facebook page & read the reviews. This might help you create a good draft of your itinerary, which with some contribution from us, can develop into a great holiday, with more local feel.